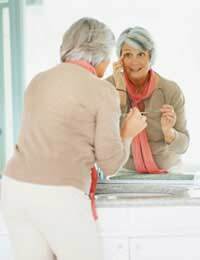 As we age we start to notice all sorts of physical signs that most of us are not too happy about: a tendency to put on weight, feeling stiff, having aches and pains, getting wrinkles and grey hair. Most of these signs of ageing can be overcome using lifestyle changes to control weight and keep active and by using cosmetic products and procedures. One sign of ageing that is difficult to disguise, however, is losing height. This occurs as the bones in the vertebral column start to lose mass, and because the discs between the vertebrae become less plump and less able to cushion the backbone. Losing height begins surprisingly early. Once someone hits 40, they start to lose height by about 1cm every decade. After the age of 70, the rate of height loss accelerates and if you live to be 90, you could be 7.5 cm shorter than when you were 40. As the spine ages, the loss of height is accentuated by the tendency for the shoulders to become rounded, causing a more obvious stooped posture as time goes on. This can easily make the height loss appear greater but the curvature of the spine also leads to back pain. Severe kyphosis, the correct medical term for a stooped, hunched back in the elderly can also cause breathing problems as the chin is forced downwards onto the chest. Medical checks usually involve a measurement of height; although losing some height as we age is normal, more rapid height loss in late middle age can be one indicator that the bones are ageing more rapidly than the rest of the body. Bone loss in the vertebral column that is due to osteoporosis causes more rapid height loss and makes kyphosis much more likely. Maintaining a healthy level of exercise from early middle age and making sure your diet is rich in calcium-rich foods can help prevent the most severe forms of osteoporosis. If you are diagnosed with this condition later on however, you may need special supplements to try and slow down the rate of bone loss. Although height loss with age may be more noticeable in women, because they tend to be shorter in the first place, men also suffer bone loss and changes in their spinal discs. A study carried out about 5 years ago revealed that men who lose the most height are more at risk from dying of heart disease, but the exact reason for this is not yet known. The study showed that men who lost more than 3cm in height in late middle age were over 40% more likely to have a heart attack or other serious coronary event, even if they had shown no obvious signs of heart disease previously. One theory is that men who fail to stay active as they get older are more likely to lose height, because of bone loss and muscle wastage, and this inactivity is the underlying cause of the heart problems they experience. Even small amounts of height loss indicate that age-related changes are starting to affect the backbone and are a frequent cause of neck and back pain in people in their 40s and 50s. As the spine curves more in more elderly people, that pain can become severe and can have a significant impact on the quality of life. Once the bone has deteriorated, it is difficult to reverse those changes and managing the neck and back pain associated with height loss involves taking painkillers to treat the symptoms and improve quality of life as far as possible.